Horror movies, video games, and combinations. Did you mess with the transparency slider? Im sure it'll be resolved later today. One escape kill I like to see motorhome. RV like in Part 6. I was thinking of how this could work too. Figured it would function like a bus, once repaired, everyone can fit in it. Maybe a throwing dart to the tire could flip it? If Jason can hulk smash it, he could go inside for offscreen kills. Or possibly somehow morph into the bathroom. I can confirm the music is part of the dynamic theme. This don't really fit but still intriguing if when Jason's out of traps he still makes a leaf pile. Favorite Non-Franchise Slasher Films of the 1980s? That averages to about June 1990. We'll see what the judges think. As for 80s "Intruder" is up there. I was thinking it could be for sound blips. Old old school radio. 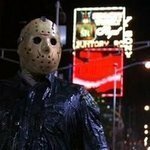 Maybe create a new stun/distraction where Jason has to kill x amount of bots before resuming. I'm not sure my playstyle yet but I'll choose Sloppy Kill specifically for the second bullet. "Allows you to attack and mutilate bodies so that they instill more fear upon discovery." Think it's a fair trade for time spent/ potential reward. It's extreme but I mainly just want to recreate Paula's cabin scene. Wish Part 6 was: - Can't run + Can speed walk What does + Rage entail? What Friday movie started it for You? Think it was Part 6 but I remember buying an unsheathed VHS of 3 at a yard sale when I was about 7. Hah yeah I figured but that's probably the closest thing there'll be. As for topic with recent movies-- Best: Get Out, Raw Worst: The __ __ Man, Sadako v Kayako Ouija: Origin of Evil was better than the first but that's not saying much. The first Q&A kind of snuck that question in when asking about character abilities being locked. The weapon part of the question wasn't addressed.